JOJO WINGS has been making premium quality canopies for all levels of extreme air-sports (paragliding, powered paragliding, powerkiting, buggykiting, snowkiting, skydiving and kitesurfing) since 1992. 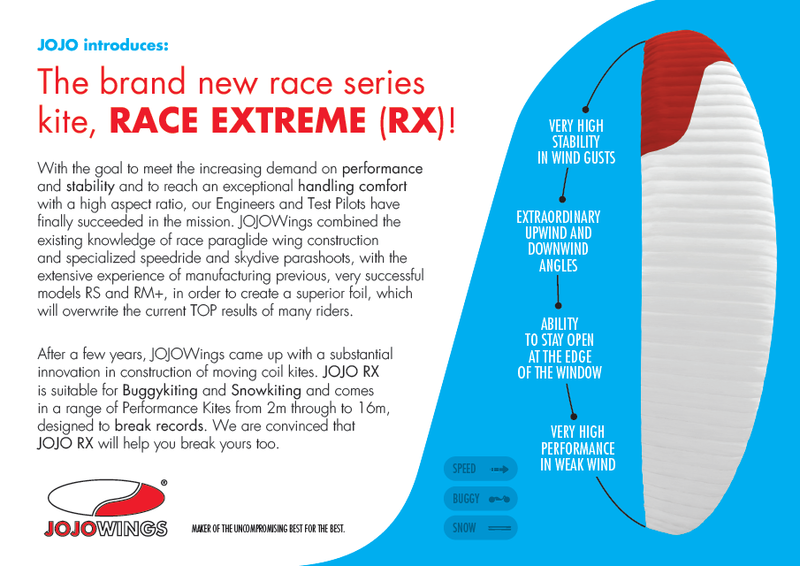 Based in the Czech Republic JOJO WINGS guarantee products of the highest possible quality. From design to the production JOJO WINGS products are manufactured in our own specialist factory here in Europe. Every JOJO WINGS product comes with a guarantee of satisfaction, precision quality and service. The JOJO WINGS team includes pilots, skydivers, kitesurfers, and board-riders. It's this combination of design and technical expertise with an active involvement in the sports which helps us stay at the cutting edge of innovation when designing our products as well as ensuring function, quality and reliability. At the same time our team reminds us that everything we develop and produce is, above all, designed for maximum enjoyment and satisfaction.